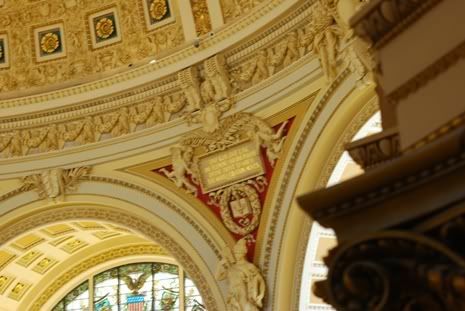 We visited the breathtaking Library of Congress today. Yes, breathtaking! See for yourself. Recognize this from National Treasure 2? We were really wanting to go in there but it is only open to those doing research. 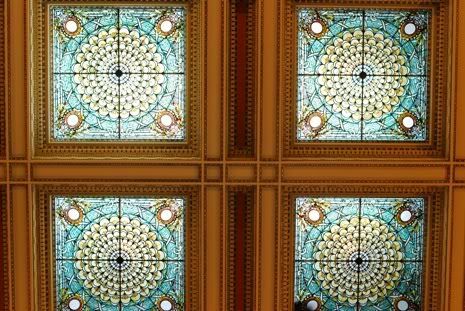 They will, however, let you take a peek if you do the library tour. Speaking of which, our tour guide was s-c-a-r-y! 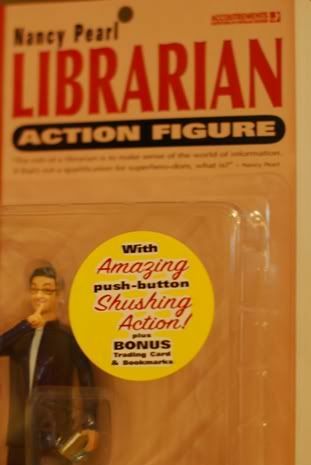 LIBRARIAN ACTION FIGURE!!! And not just any lame old action figure, but one with SHUSHING ACTION! I've been laughing all day about it. Because yes, I am that dorky. So, do you have a fear of librarians like I have a fear of clowns? I have always loved the librarians that I have known. They were always knowledgeable, helpful and kind. The only fear I have ever had was with this one tour lady librarian person. And the clowns are a whole other post! We were in DC on Thurs, Friday, and Saturday. We just got home a little while ago. What a coincidence! that is sad she was so rude especially to an older gentlemen. :( Unfortunately we have a similar librarian... She doesn't like me too much... then there are others who are so nice. Hey Coco, those pics are SOOC! :) Washington DC is very photogenic! oh that action figure is the souvenir to get! LOL...That librarian action figure comes straight out of the Mountains of Tennessee...those ladies would eat you alive! LOVE visiting all of these exciting places with you! 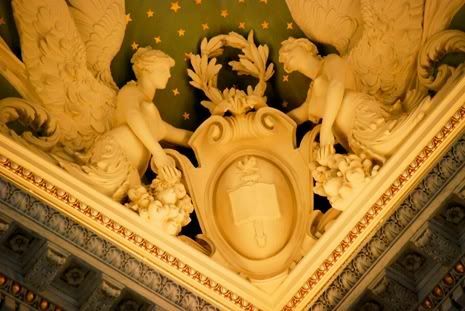 Isn't that the room of the Library of Congress that is on National Treasure when they find that book with the clues in it!?! Glad you are seeing all of these neat things! Talk about experiencing American History. The tour guide wasn't a librarian. Just a tour guide. 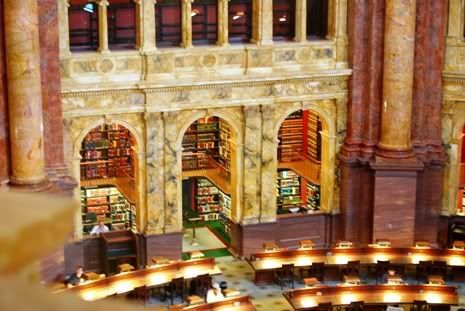 It's a common misconception that everyone who works in a library is a librarian, but I can almost guarantee that the librarians at the LOC aren't leading tours. 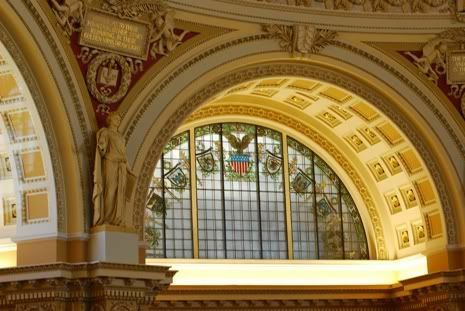 These pictures are beautiful; the Library of Congress has been on my list of places to visit for a long time! i was trying to think where it was that we ran into snooty staff. i remember now-- it was at the chicago institute of art. at least they weren't mean, though. that action figure is hilarious. see, *somebody* at the place has a sense of humor. Hi Marsha, I just found your blog and have spent half an hour surfing around it... and just wanted to tell you how great it is. Girl I hate clowns too! Thanks to older relatives making me watch "IT" when I was a kid! I HATE clowns-they're scary! LOL!!! Did you get one? i try not to get carried away with the souvenir buying, mostly because we dnever go anywhere, and then because everything costs too much, but even I would've bought one of those! LOL!! I can see my kids playing with it now... SSSHHH!!! Okay, you are planning my next vacation and coming along to take the photos! What a great story, tour and photos! As for the scary tour guide...the sad part is that she probably deals with people chit chatting the whole tour!